In case you want a smartwatch that's not made by a smartphone vendor, Fossil has something for you. The company (known for its regular wristwatches, but also for accessories and other products) today announced its first line-up of smart wearable devices, created following a collaboration with Intel (of which we first heard last year). The line-up is dubbed Fossil Q, and includes an Android Wear smartwatch. Presented as "a powerhouse packed into an elegant package", Fossil's first Android Wear watch is called Q Founder. There aren't too many details about it, but we know that it's got a metallic body and a circular display (which is pretty big, according to Mashable), and will work with Android handsets, as well as with iPhones, thanks to a dedicated Fossil app. Fossil says that the Q Founder will be released in time for the holiday season (presumably in the US first). Prices for the smartwatch will start at $275. The Fossil Q series also includes the Q Grant watch (priced as low as $175), which can sync up with Android phones and iPhones (using the same dedicated Fossil app) to deliver notifications and track your steps. This isn't an Android Wear watch, though - it's a regular watch that's a little bit smarter than the rest. Fossil also has two smart bands: the Q Reveler (for men) and Q Dreamer (for women), each costing $125. They have similar designs, and let you choose from either leather, or silicone bands. Fitness tracking, notifications, and vibrating alerts are among their features. Unlike the G Founder Android Wear watch, the Q Grant, Q Reveler, and Q Dreamer will all be sold by Fossil starting October 25. The Fossil Q Founder Android Wear smartwatch. Note that the Q Grant isn't an Android Wear smartwatch (only the Q Founder is). Of course, that shouldn't stop anyone from liking it. Hmmm, I actually like Samsung and Huawei designs better than Fossil already, which is surprising to be honest. Let's see how nice the Tag looks. Moto still has a long way in both phone and watch design IMO. The Moto 360 is a really nice design. But clearly you don't like it. 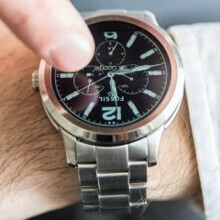 Personally I think the Moto 360 has a futuristic design. I liked the Moto 360 1st gen design besides the spare tire. They butchered the 2nd gen pretty badly though. The Moto 360 design is a fail. It went backwards with this iteration. putting strap lugs on the round watch case was a HORRIBLE idea. Well, putting NARROW strap lugs on the case was a bad idea. Had they made the strap proportionally wide to the case diameter, it would have a chance. The other design failure is that it's simply a round, straight sided case. UGLY. In order to make a watch of this size look decent and to hide it's bulk.. you need to make it curvy. The design needs to have the case flow into the strap, like LG has done. Moto has a great opportunity with the watch.. get rid of the flat tire by using the transition between the case and band for the electronics taken up by the fat tire.. THEN it may be a winner. I like my gear S2 100 times more for the design alone. Looks much better than the Moto 360. People on this site very so often feel the need to act like their taste in a products design should reflect upon everyone's taste. What if someone told you, you can like X, he can like Y, and she can like Z...without any problems? Waiting for Lg watch urbane 2nd edition 3g review. And Samsung Gear S2 3g review.